It’s only good friends that cook for me in their home, others say they are intimated to make dinner for a cooking teacher. Two of those good friends are Tim and Barry who made a delicious Sunday night supper for me recently. 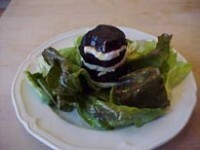 Here is my interpretation of Tim’s Beet Salad. The people sitting around the table are some of the students from Tante Marie’s Cooking Vacation. 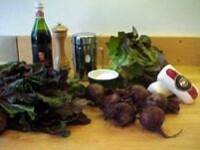 To prepare the beets, cut the stems of the beets leaving at least 1 inch. 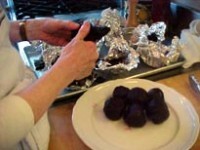 Coat the beets in vegetable oil, wrap each one in foil separately, and place on a baking sheet in a 400 degree oven about 45 minutes, until the beets are tender when pierced with a fork. 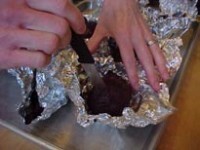 Remove the beets from the oven and the foil from the beets. When the beets are cool enough to handle, remove the stem and skins. Cut the beets and cheese into 1/4 inch slices, sprinkle with salt and pepper, and layer them back into the shape of a beet, that is round. To dress the salad, place the vinegars in the bowl of a spoon with a half a teaspoon of salt. Stir to dissolve, pour over the lettuce in a bowl. Pour over the olive oil, grind over pepper and toss. 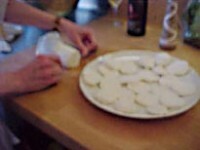 Add any accumulated juices from the beets. 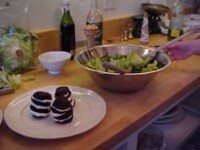 Place one sixth of the lettuces on each of six salad plates, place a beet/cheese round in the center of each, drizzle with additional olive oil and serve.